The Eastbourne Pippin was grown by E.A. Lindley from Eastbourne 1930 and believed to have been grown from the pip of a Newton Pippin. It is currently cultivated as part of Brighton Permaculture Trust’s National Collection in Stanmer Park, Brighton. You can see an Eastbourne Pippin apple tree (planted 2011) in Home Farm Orchard, Stanmer Park ( map). 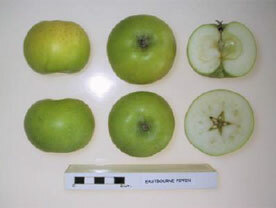 The Eastbourne Pippin apple is large, rectangular in shape and slightly ribbed at the eye. The skin is golden yellow with a sweet, firm, creamy flesh that becomes soft and crumbly by October. Fruit can be picked late August and stored until September or October. The Eastbourne Pippin tree is moderately vigorous and can be heavy cropping.